An exceptionally large 2 bedroom apartment within prestigious riverside development. Benefits from 12hr concierge, swimming pool, gym, underground parking and 3 private balconies. Berkeley Tower is situated moments from the amenities of Canary Wharf which provides an impressive selection of shops, bars and restaurants. The nearest underground station is Canary Wharf (Jubilee Line and DLR). 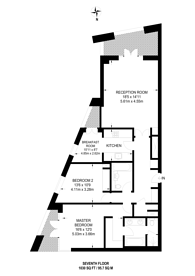 1,030 (95 Sq M) approx.